Wondering where to have a romantic experience in Southeast Asia? I've listed my top 7 most romantic destinations in Southeast Asia based on the places which I have visited. These places will definitely give you memorable romantic experiences. The environment is conducive and supportive for dating-for that spark that you are looking for. These are the places in Southeast Asia where you should take your date, spouse, or fiancee. I guarantee you'll have a quality romantic time in Southeast Asia. So this month of love, pack and head to these destinations and make those romantic fantasies of yours real. The City of Angels, the Land of Smiles. Who can't be captured by her charm? From street foods to temples, theme parks to malls, restaurants to palaces, Bangkok is your typical Asian mega-city. Although it has the worst traffic jam in the world (yes, worse than Manila), still I consider it as a romantic place. When dating, you want to have lots of options-from activities to choices of restaurant-and Bangkok has it all. One of the most convenient cities I have been, Bangkok is definitely a destination for lovers. 4-5 star world class hotels abound. Cuisines from different parts of the world, from French to Italian, Mediterranean to Indian, Russian to Japanese, they have it all here. Just last month, I even discovered an Ethiopian restaurant. Everything is in Bangkok. A great destination for dinner dates indeed. And basically, Bangkok is generally safer and cleaner compared to other Southeast asian mega-cities. And with a cost of living as low as that of the provinces, it is a paradise to many. Visit the Grand Palace and Temple of Dawn, dine in some of the best restaurants in town like Chocolate Ville and Asiatique. And For a variety and extra flair, you can also choose to have a dinner while cruising Chaopraya river serenaded on board or dine on top of Vertigo restaurant or Baiyoke tower overlooking the city. Try the street foods of Khaosan road, visit museums and planetariums, have a relaxation in its countless 5 star hotels, pampering at Spas, shopping/window shopping at Siam Paragon, have an adrenaline-pumping experience at Dream World theme park and Siam City water park, stroll and have a picnic at King's Park (Suan Luang), ride a tuktuk, relax in Ananta Samakhom Throne Hall, watch live sporting events at National Stadium, Impact Arena and Rajamangala Stadium. These are just some of the activities that you can have with your partner. You won't be bored in Bangkok, but will have an awesome romantic experience. One of the laid-back yet touristy places in Southeast Asia (Is there such a thing?) Bagan caught my heart in 2012 when I visited it alone (How romantic is that?). It is approximately 10 hours from Rangoon. How romantic is Bagan? Well, imagine yourself in an ancient city, with thousands of ancient temples around. The atmosphere is laid-back, quiet, and peaceful-talking about solitude. Explore the temples with your loved one aboard a horse cart or if you want a slower pace, you can have an ox cart. Witness the sunrise on top of one of the pagodas, glowing on Bagan's misty ground. Stroll along the temples in the afternoon, and enjoy a peaceful time, just you and your partner. And if you have some more cash to spend, you can rent a hot air balloon to enjoy the beautiful scenery. Although Bagan is a laid-back city, located 4 km. is a town called Nyaung U where hostels, guesthouses, and restaurants abound. This is a great place to have dinner.Have an aunthentic Burmese tea, try their famous Mohinga, and just relax for a wonderful romantic stay in this laid-back and historical place. Located 634 meters above sea level, Tagaytay, a city in the province of Cavite in the Philippines is a favorite destination among honeymooners and lovers. 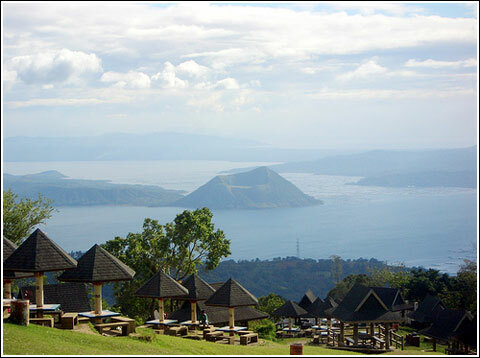 With a picturesque view of Taal lake and Taal volcano, a visit to Tagaytay will be one of your most memorable dates. Lots of restaurant abound the area. One of my favorites is Leslie's, which serve delicious Filipino foods located overlooking Taal lake. Or you can simply have a cup of your choice of beverage in Starbucks, overlooking the lake as well. Don't forget to visit Taal Vista, and try horse back riding. In my former post, I called Krabi a paradise on Earth. Blinding white sand, turquoise clean waters, limestone karsts, long-tail boats, islands, luxurious hotels, guesthouses, quality restaurants-all of these can be found in Krabi. A coastal town located south of Thailand. Enjoy the natural beauty of Krabi with your partner on a long-tail boat. Snorkel together, swim, feed the fish or simply bask under the sun. My favorite spot is a bay called Poda Bay located in one of the islands called Poda. It's so peaceful, fresh, secluded and quiet. And for adrenaline-pumping activities, head to Railey and try different water sports such as canoeing, kayaking and deep water soloing. The most charming city I have been to, there's something in Siem Reap that keeps me coming back. It's like I really can't get enough of her. If these are all ladies, Siem Reap would be the most charming. Her charm captivated me which resulted in a 3-time visit and counting. If not for the humid climate, Siem Reap would be my number 1. It was just beaten for the number 1 spot because it doesn't have the cool climate that we all want for that romantic experience. So what makes Siem Reap romantic? When I first arrived here in 2011, the laid-back slow-paced life in this city was a respite to me. No traffic jams. And colonized by the French, cycling is still a popular mode of transportation. Those laid-back, relaxing feeling are some of the factors which makes this city, charming and of course romantic. There are a lot of hotels in the area, from simple guesthouses to luxurious 5-star hotels-you'll have a lot of choices. Roam around the city and the nearby vilages on a remorque-moto/tuk tuk. Siem Reap has the most romantic tuk tuks in the world. Believe me. Restaurants? Oh, from authentic Khmer street foods to almost every cuisine in the world, they're all here. It's also a walking city. Stroll around the city with your partner, have a massage along the streets, shop and dine. Oh, and not to forget one of the most famous sunrises in the world-the sunrise over Angkor Wat-will surely complete your romantic holiday. Lush mountains, cool climate, tranquil, cultural, hippie- Pai definitely deserves to be the number 1 in my list. This is a perfect setting for a get-away, to escape the your busy lifestyle and just relax. It's located in the North of Thailand in a province called Mae Hong Song, 4 hours by van from Chiang Mai via 762 curves. So don't forget your motion-sickness medicine if you plan to come here. It is blessed with waterfalls, river, and forests. The place is a "hippie" place with lots of cool people from all over the world. Yes, it's in the mountains but has lots of foreigners around. Think of Khaosan road minus the load music and crazy people; so there are lots of restaurants, cafes, and shops are in the area. You can just walk in its streets and will have lots of options. Convenience will not be compromised even if you are in the boondocks. No wonder the Thais made a romantic movie here entitled Pai in Love. This is a perfect place for that tranquil romantic getaway that you are dreaming of. Life is short. So enjoy, go out and date! Have fun! Give love and find the joy in your life. The streets are full of strangers"
Which of these places in Southeast Asia do you want to have a romantic holiday? Choco Ville is really nice. I love the ambiance there. Thanks do. These places are really romantic. through Google, and found that it's really informative. I'm gonna watch out for brussels. Your Site seems pretty informative with good pictures of different places with the updated information. You would like this video as it seems to be of simliar interest , if you love travelling this video would boost you up to make a trip. Genuinely when someone doesn't know after that its up to other visitors that they will assist, so here it takes place. Can your website be found on the first page of a search. in Los Angeles to carry this out efficiently, appropriately and safely. I am also a very romantic person and i spent my hoonymon in Bangkok, Thailand just 2 month ago. Bangkok is just a awesome for couples and lovers. That was remarkable moments for me and my wife also. I'm glad you've enjoyed Bangkok. I really love Bangkok too.